July 2, 2018) — Visitors to the ANA 2018 World’s Fair of Money in Philadelphia can see an impressive exhibit of classic United States commemorative coins, many of them the finest known and many with spectacular, original toning. The 144-coin collection, “The J&L 144 Complete Set,” is ranked as both the Current Finest and All-Time Finest in the Professional Coin Grading Service (www.PCGS.com) Set Registry®. “This amazing set will be publicly displayed at the PCGS booth (#1431) during the ANA convention, August 14-18, and we anticipate it will attract quite a bit of attention because of its tremendous quality,” said PCGS President Don Willis. Named after the first names of the collection’s owners, John and Linda, the J&L commemoratives collection has a set rating of 68.705, just a few points away from perfection. Also, 27 of the coins are the single finest graded of their kind, and 77% of the coins are “Top Pop” in the PCGS Population Report, according to Searls. “The J&L Set illustrates the owners’ search for not only highly graded coins, but also coins that come alive with glorious toning,” explained Searls. This 1920 Pilgrim half dollar, PCGS Gold Shield MS68, is one of the many highlights of the J&L commemorative coin collection — the PCGS Set Registry® Current and All-Time Finest Set — that will be exhibited by PCGS at the ANA 2018 World’s Fair of Money®. Photo credit: Professional Coin Grading Service www.PCGS.com. The finest known 1925 Lexington half dollar, graded PCGS Gold Shield MS68+, is part of the 144 coin set in the J&L Collection of commemoratives that can be seen at the PCGS booth during the ANA 2018 World’s Fair of Money®. 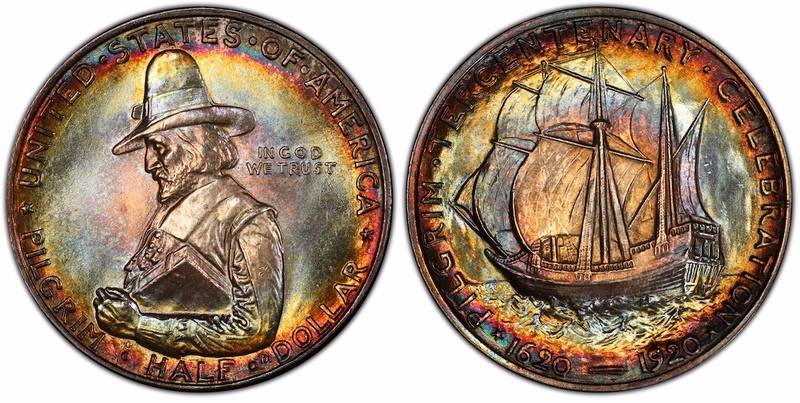 Photo credit: Professional Coin Grading Service www.PCGS.com. 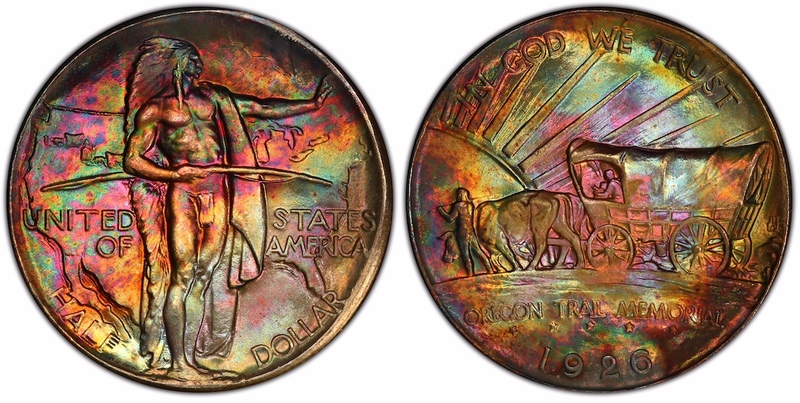 Many of the coins in the J&L Collection of U.S. commemoratives have spectacular, original toning, including this 1926 Oregon Trail half dollar, graded PCGS Gold Shield MS68+ and the finest known. Photo credit: Professional Coin Grading Service www.PCGS.com. 1936 Wisconsin half dollar, PCGS Gold Shield MS68+. “The J & L Collection is a perfect example of what collectors can achieve when they put their hearts into their hobby,” said Searls. “PCGS is honored to display John and Linda’s beautiful set of commemoratives at the upcoming ANA 2018 World’s Fair of Money in Philadelphia, and also at the Long Beach Coin, Currency Stamp & Sports Collectible Expo (www.LongBeachExpo.com), September 6-8. 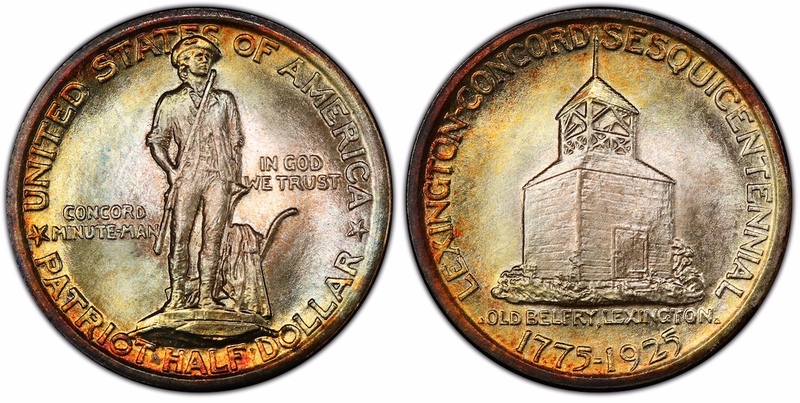 The set can be viewed online at https://www.pcgs.com/SetRegistry/commemoratives/commemoratives-major-sets/silver-commemoratives-144-piece-mintmark-variety-set-circulation-strikes-1892-1954/alltimeset/142776.